GitHub is a web-based Git or version control repository and internet hosting service. It is mostly used for code. It offers all of the distributed version control and source code management (SCM) functionality of Git as well other features. It provides access control and several collaboration features such as bug tracking, feature requests, task management, and wikis for every project. As of April 2017, GitHub reported having almost 20 million users and 57 million repositories, making it the largest host of source code in the world. 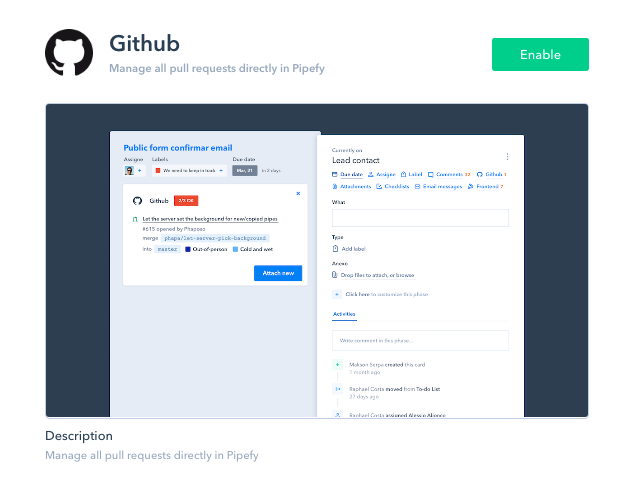 By enabling Pipefy's GitHub pipe app you will no longer need to open GitHub to keep track of your pull requests. 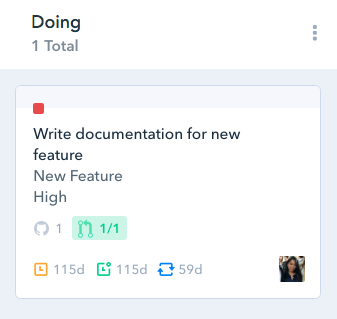 Connect Pipefy to GitHub and attach pull requests to your cards to keep track of them, easily checking the cards to find out whether your requests have been merged. How to enable the GitHub app? Enabling this app is easy: open the sidebar menu of your pipe clicking on the gear icon on the upper right corner of the screen then click on apps. Once you click on it, the Github app tab will open on the left side of the card. 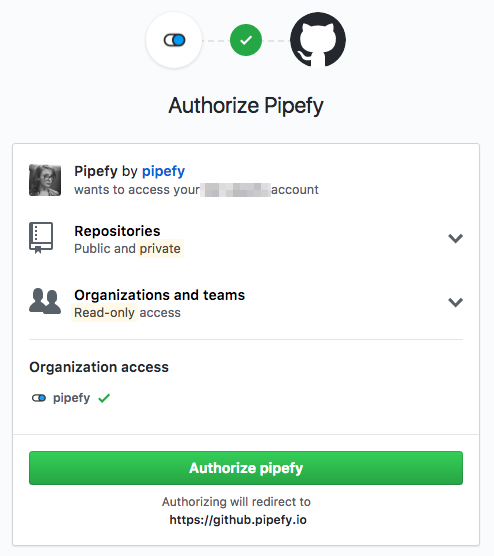 When you click on "attach" for the first time you'll have to authorize Pipefy to access your Github account. You'll see the PR's name, its repository, its number, labels (if applicable) and the name of the person that created it, as well as the branches it'll be merged from and to. You can attach multiple PRs from multiple repositories to a card. Each time you click on attach, Pipefy will ask you to pick the repository and PR. When you click on the PR within the card you'll be redirected to Github. You'll also be able to see in the closed cards how many pull requests are attached to this card and how many have been merged. If the icon is green, as it's in the image above, it means all PRs have been merged. If it's yellow it means that at least one of the attached pull requests haven't been merged yet. The PRs status is automatically updated every minute so you can be sure the information displayed in your cards is always up to date. To disable this app, simply open the sidebar menu > apps > Github and click on 'disable'. Ps. Pipefy's Github app doesn't yet support Github Enterprise.